This family drama from Alex Kurtzman has my vote for most meaningless title of the year, and I can't say that what unfolded under this generic banner lent it any more heft. 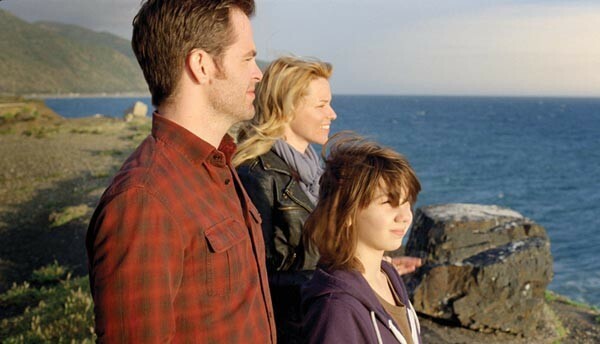 A young man named Sam (Chris Pine) is estranged from his Los Angeles family, but returns when his rock-producer father dies. And as these things go, he discovers that his dad has bequeathed him $150,000 — wait for it — to deliver to the son of the sister he never knew he had. Sam easily finds his sister, Frankie (Elizabeth Banks) and her precocious, long-haired wild child (Michael Hall D'Addario). She's a struggling cocktail waitress, and Sam fake-bumps into her where everybody in L.A. meets — at an AA meeting. And for reasons that make no sense except to a filmmaker looking to stretch out a thin plot, Sam doesn't bother to tell his sister who he is until the last reel. This narrative feint results in a number of not-good aspects, not least of which is a creep factor when Frankie starts to fall for Sam. The Family's Secret Shame is a gimmick left over from women's pictures of the 1930s, and couldn't feel more ridiculous in 2012, when there are no shortage of families that are blended, fatherless, weirdly scattered and whatnot. But worst of all, Sam's inexplicable silence robs the film of any emotional investment we might have had, since it's such an obvious low-rent dramatic cheat. All we can do is impatiently drum our fingers until Sam fesses up and Frankie gets mad, and ... well, you can guess the rest.